Home » Lois » Do Old Ads Pinpoint Studio Tonnesen Shared with Fox? Do Old Ads Pinpoint Studio Tonnesen Shared with Fox? Beatrice Tonnesen shared her studio with noted artist R. Atkinson Fox during the 1920’s, according to Rita Mortenson, author of two books on Fox. On pages 16 and 17 of R. Atkinson Fox: His Life and Work (L-W Books, 1999), Mortenson writes that Fox “shared a studio with the professional photographer Beatrice Tonnesen on Pine Grove Avenue, south of Diversey Park.” But biographical information on Tonnesen indicates that she and her sister, Clara, set up their studio in 1896 at 1301 Michigan Avenue, with no mention of a second or later studio. So I set about trying to locate that Pine Grove studio. The archives of the Chicago Tribune yielded two interesting classified ads placed by the Tonnesen Studio. Wanted – Attractive young ladies to pose for high grade calendar pictures. Call Monday. Photographic Equipment. Cooper-Hewitt lights, printer, etc. That Hampden-ct. address (now shown as N. Hampden Ct.) is only a block from Pine Grove. I believe that Mortenson got much of her information from the spoken recollections of Fox’s children and friends, so it would be understandable if the larger street, Pine Grove, proved to be more memorable to them than the smaller Hampden- ct. These classified ads indicate that by 1919, Tonnesen had either moved from Michigan Avenue or opened a second studio, and she remained there at least through 1927. 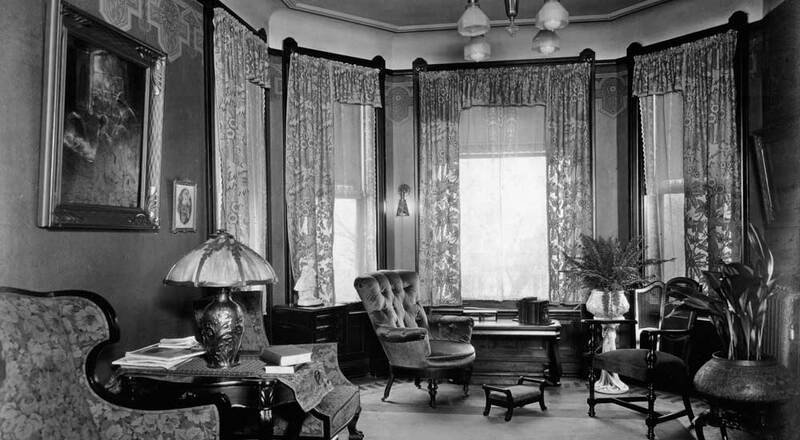 My guess is that this was the “Pine Grove” studio to which Mortenson referred, in which Tonnesen worked with Fox during the 20’s. Just read your article on the Pine Grove studio. You certainlly are finding the clues out there. Very interesting. Is this the studio that you shared the photograph of? The one with Virginia’s picture on the wall? Or was that the Michigan Avenue studio? Virginia Waller & her parents lived at 1314 W. 64th Street in Chicago. Depending on how near that was to the studios may be of some help. Keep watching…we’re making arrangements to post that image of the studio, which we now believe to be the Pine Grove/Hampden Ct. studio. Glad you’re enjoying the website, and thanks again for all of your help.